I remember the day I heard my heart say, “Shannon, I want you to know your purpose as badly as you want to know it. In fact, I want you to know it more than you want to know it. So trust me. In the time that you are to know, you’ll know what you need to know. In the same way I was reminded of this truth, I’m going to remind you today as well. Trust your heart. Trust God. Trust the process of life. When it’s time to know your purpose, you will know. Then, will you trust yourself enough to do something with what you know? If you feel as though you don’t yet know your purpose, don’t worry…you will KNOW when it’s time for you to consciously know. You may know your purpose, but for some reason you haven’t listened. Whether you’re nervous about not being sure if you’re going to discover your purpose, or you know it, but you’re nervous because you’re not really sure how to enter into it…this is for you. I’ll take all the guesswork out of it for you. No more running around trying, wondering and worrying if you’re going to figure it out or be able to fully enter into your purpose. 1. We’re all here to LIVE. Why? Because you have LIFE flowing through you. God breathed the breath of life into the dirt, and created a human being. We were designed to breathe…INSPIRATION. What is your inspiration? What inspires you? You have LIFE flowing through you. You have inspiration in your soul that’s been put in you for such a time as this. You’re not here by accident. You have a purpose that’s been breathed into you by God, and it’s to LIVE. You are ALIVE. Are you living in your INSPIRED state? Are you breathing in the inspiration from the Creator of all things? You can be a co-creator in your own life, if you take action with inspiration. Express the inspiration that IS you in the life you’re living. 2. We’re here to LOVE. From the time you showed up on planet earth, there’s been a whole lot of LOVE around you. There’s an attractive, magnetic energy that comes with new life. That little baby (new life) is still within you. All the LOVE that you came into, because of, and with, and have created since you’ve been here…that’s LOVE, my dear. You are designed to LOVE. Love yourself, and YOUR LIFE. Love yourself living your life. Tap into the inspired place within your soul, knowing that you’re here for a purpose, for such a time as this. This will allow you to love yourself and your life. If you’re not loving you and your life, then stop trying to find your PURPOSE, and start loving yourself right now. Love the one you’re with, which is YOU. When you begin to do this, you’ll start to uncover and discover TRUTH about yourself. Listen to your heart…the LIFE that’s within you and is calling you…it will begin to make sense. You could be trying so hard to discover your purpose that you’re overlooking it. First, you must live your life well…fully engaged and present to it. Live the life you’re in. Live it with the inspired breath of your Creator and co-create the life that you love. Second, are you receiving the love that you are, and giving the love that’s within you? Are you doing that? Are you being an active participant in your life, an active co-creator with God? With the energy, source, and LOVE that created you, my dear…for such a time as this!! 3. When you do #1 and #2…your life will WORK. And in the process of your LIFE WORKING…you’ll discover your LIFE’S WORK. Stop looking outside of yourself to discover your purpose. Look inside your own soul. What makes you absolutely feel so inspired, and so happy…that it makes your heart sing? That is the path to purpose…LIVE. LOVE. Make love with your life, and it will LOVE you back. 2. Write down the words LIVE and LOVE. 3. Then write down how you’re doing both. How are you living on purpose? How are you loving on purpose? See what happens as you begin to write. I would love to hear from you, and know how you’re doing in this process. WomenSippingOnLife.com. If we’re not living and loving on purpose, then we’re doing it by accident. We’re NOT going to do that! No way!! A woman sipping on life is a woman that’s presently ON PURPOSE in her life. Thank you for being here!! Thanks for letting me share…as a reminder to you and me. 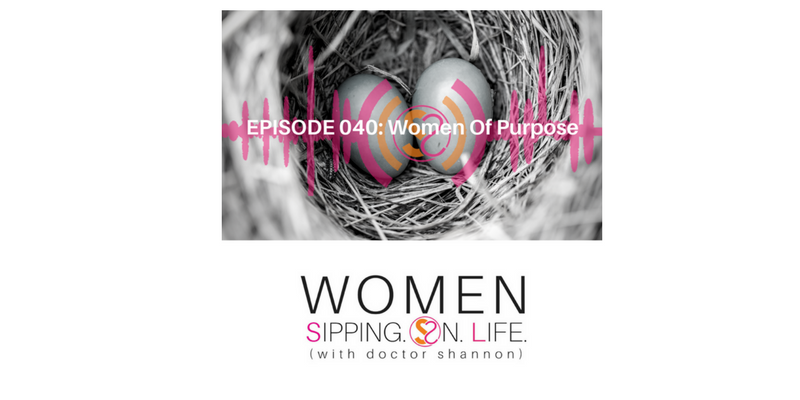 I love you, and I appreciate you for being on this journey with me…our 40th episode. kEEP ON KEEPING ON DOC!